Can anyone please supply any material, stories etc connected with ASLSFE. I spent 1963 based at RAF Tengah with 81(PR) Sqn and Alan was also involved subsquently. Brian Weir, Ian Cragg, Harry Hawkins and Vic Cook were on a detachment to Labuan in May/June 1963 so it would be good to get some other views and experiences. When it was first established, where it was located in the early days i.e. Tengah or Seletar, and who manned it over the period of its existence, other than those already mentioned. My name is John Hamnett. To enquire if any of your contacts served on Crown and could pass on any stories and pictures to me. 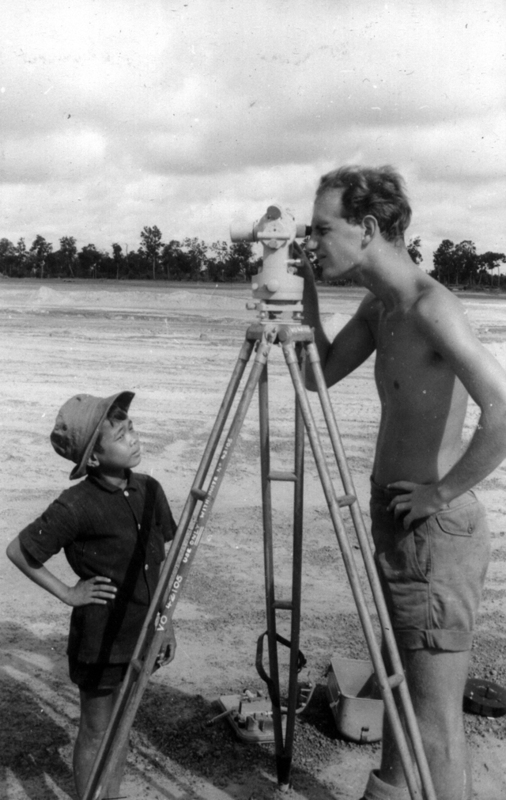 I've attached a picture taken of David Ringwood, this pix was taken in the very early days of Crown when the initial earthworks were going down ( I would imagine the Theodolite is a type you would have used). I'm assuming he was on detachment to Crown from 84 Survey. Secondly to enquire if anyone is in contact with 'Taff' Davies/Davis. I think he was a surveyor, I know he served on Crown in 1966 as he played in the 'Bangkok 7s' Crown rugby team (standing far right in attached team pix). I'm assuming he also served with 84 Survey and was on detachment to Crown. A SEATO project to build an airfield in the North East of Thailand. If we get enough information the we will publish this under memories, so please let the webmaster know.